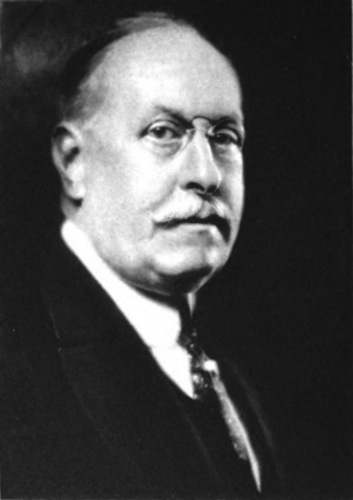 On August 11, 1896, Bridgeport inventor and industrialist Harvey Hubbell patented a socket for incandescent lamps. It utilized a simple on/off switch contained in the base of the light socket and controlled by a pull chain—a design that remains popular to this day. Thomas Edison invented the first practical incandescent light bulb in 1879 and central power stations started to spread across the country soon after. As electric lights began to replace the gas fixtures found in most homes, Hubbell sought to provide a simple, safe, and cost-effective pull-socket. Today we walk into a room and hit a switch on the wall to control our lights, but during the late 19th century gas fixtures were controlled individually and normally found in the center of a room’s ceiling or high up on a wall. When electric fixtures replaced these it was costly to install the separate wires, circuits, and switches required to operate them individually, so people often left lights on even when they were not needed. Hubbell’s solution provided the circuit and switch as part of the socket which could be manipulated by simply pulling a cord. 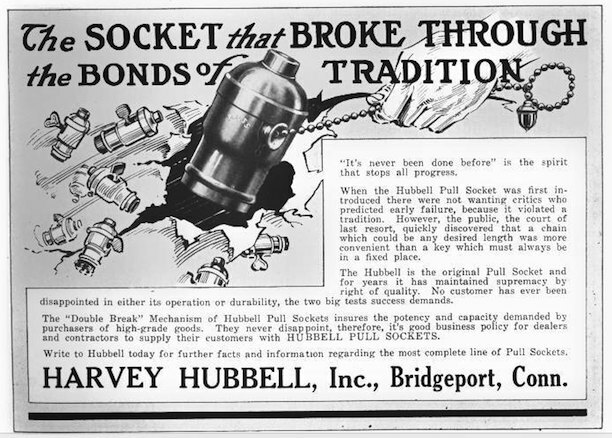 The success of the pull-chain socket allowed Hubbell to expand his business. A pioneer in the electrical industry, Hubbell opened his first manufacturing facility in 1888. He went on to receive another 45 patents, most for electrical products, including the Separable Attachment-Plug. The company Harvey Hubbell began, Hubbell Incorporated, is still in business today and headquartered in Shelton, Connecticut. Hubbell, Harvey. Patent Number 471,612 - Electric Switch. 471,612. Bridgeport, CT, issued March 29, 1892. Link. Hubbell, Harvey. Patent Number 565,541 - Socket For Incandescent Lamps. 565,541. Bridgeport, CT, issued August 11, 1896. Link. Hubbell, Harvey. Patent Number 774,250 - Separable Attachment-Plug. 774,250. Bridgeport, CT, issued November 8, 1904. Link. Harvey Hubbell, Inc., and Western Electric Company. Electrical Specialities: Catalogue and Price List No. 9, August, 1906. Bridgeport, CT: The Company, 1906. Link.